Off the Rails Arthouse is delighted to welcome Lara back to teach a two-day workshop. 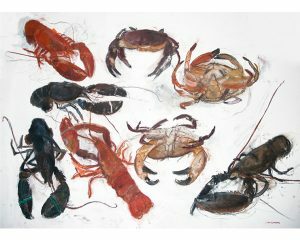 Well-known for her beautiful pastel drawings, Lara is extending an invitation to work with her in mixed media and to explore subject matter dear to her heart and highly appealing for people who love Fife and its stunning coast. Lara will arrange natural materials gathered along the Fife coast including shells, skulls, feathers, seaweed and crustaceans to create a sense and feel of the shoreline. You will be encouraged to contribute a relevant found item big or small to be incorporated into the still life. Over the two days Lara will guide you through the different stages of composing and tackling a still life using a wide variety of materials, which will enable you to create your own unique vision of a shoreline. The wide variety of textures and colours that make up the still life will be explored through mixed media. Lara will provide a selection of materials including ink and charcoal but you are welcome to bring any other materials you may wish to use such as paper/canvas, brushes, paint (acrylic, watercolour, gouache) and colourful oil/chalk pastels. There will be a strong emphasis on drawing which will run throughout the workshop, with references to artists who use found objects to create lively compositions, including Elizabeth Blackadder and Duncan Shanks. This workshop is suitable for anyone with a basic knowledge and enthusiasm for drawing and painting, or who would like to try new techniques and extend their skills.